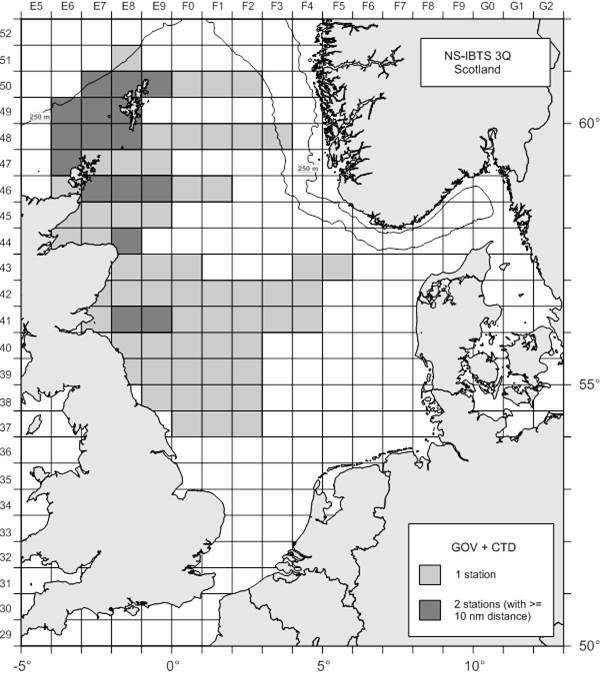 Complete an internationally coordinated demersal trawling survey in the North Sea in ICES area IV. Obtain temperature and salinity data from the surface and seabed at each trawling station using a SEABIRD 19+Conductivity, Pressure & Depth (CTD) device. Collect additional biological data in connection with the EU Data Collection Framework (DCF). Opportunistic completion of zero hours hauls to assess unquantified time spent by the trawl on the seabed. 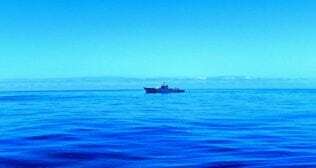 Deployment of three Autonomous Underwater Vehicle (AUV) gliders as part of the AlterEco project. Scotia set sail on the morning of 28 July and proceeded to the first station northeast of Peterhead at the Buchan Deeps (North of 57o 30’N), where a shakedown haul was completed to check the net configuration and the SCANMAR units. There are 73 programmed rectangles to be surveyed (shown below). 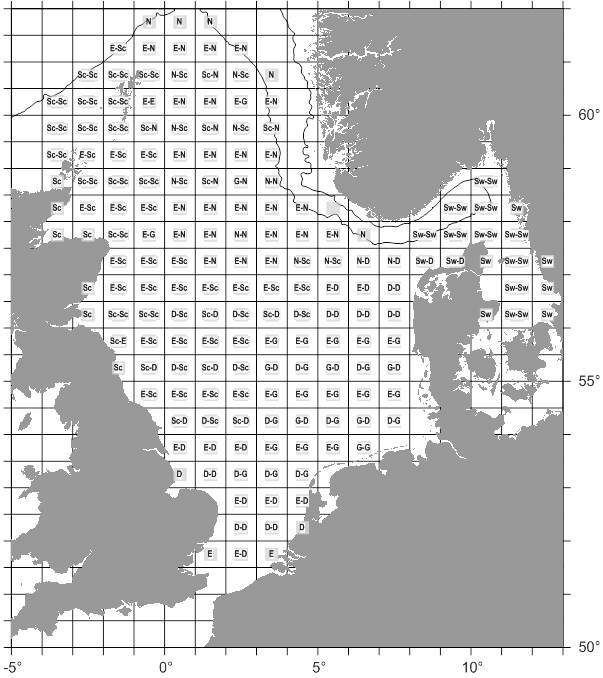 Trawling will be undertaken during the hours of daylight which will vary depending on the vessels latitude at any given time. Towing time at each station is 30 minutes as standard. Due to the discussion at the International Bottom Trawl Survey Working Group (IBTSWG 2017) additional information on trawl deployment and retrieval will be recorded; to better understand variability and provide an accurate estimation of the total time required for each vessel to successfully complete a 30 minute tow. 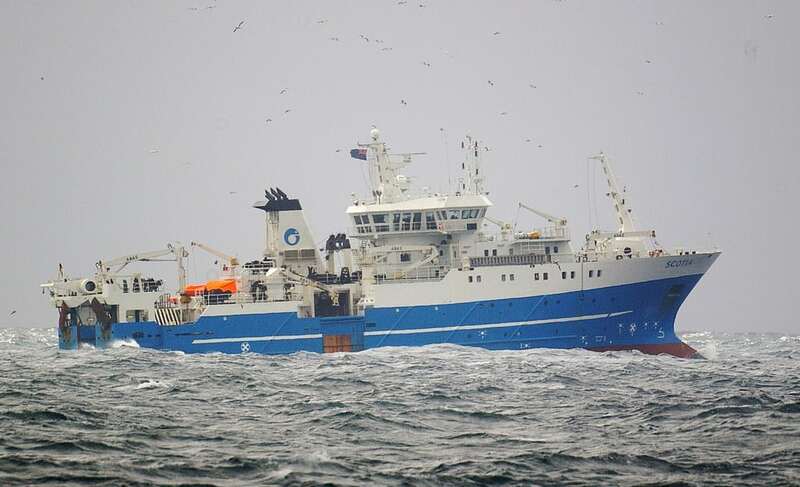 Further to this, and if time permits, Scotia will also undertake several 15 minute trawls followed by zero-hour trawls (defined as when the trawl is hauled as soon as the nominal haul duration would have started in an ordinary research haul). Zero-hour deployments will be completed in sets of three along a single extended trawl track and at a range of depths. The GOV survey trawl will be used solely with the 47 m (short) sweeps throughout the survey. Two ground gear types will be used during the survey, the lighter “A” rig being used on all stations south of 57o30’ N and the heavier “B” rig being used north of 57o30’ N.
The SCANMAR system will be used to monitor the headline height, wing spread and door spread for each haul. Bottom contact data from each haul will also be collected using the NOAA bottom contact sensor which will be mounted in the centre of the ground gear. In addition to the routine sampling utilising the EDC system, biological data will be collected for target species in line with the EU data regulation. All fish will be processed in accordance with Standing Instructions. CTD casts will be taken at every trawl station. These provide surface and bottom temperature and salinity information. Reverser bottles affixed to the CTD wire will also be used to collect water samples that will be analysed back at lab to provide information on salinities, nitrates, silicates and phosphates. In addition, 17 (20 litre) carboys will be filled with sea water, according to the Water Collection SOP (0805 – Section 8.3.1) for the Chemistry department at the lab to use for nutrient analysis. In collaboration with the National Oceanography Centre, Liverpool, we will aim to deploy one AUV glider at the most northern point of the survey in 51E8 and two further gliders around 56o00’N, 02o00’E.